Following an interesting thread on Facebook and some e-mailing back and forth with Patricia Simone Fink OD and Eric Hussey OD who were generous enough to share their time, research and experience with me, I decided to make another investment in my vision in the form of Electronic Rapid Alternation Occlusion Goggles. New year, new projects and new ways of approaching existing problems! What are Electronic Rapid Alternate Occlusion Goggles? Without stealing too much of Eric Hussey’s spotlight I want to explain some of the ideas behind the treatment. 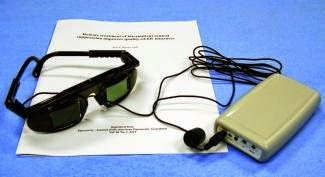 In his study ‘Remote treatment of intermittent central suppressionimproves quality-of-life measures‘, Dr Hussey extensively tests this type of goggles on young adult students at Job Corps with significant reading difficulties due to diagnosed intermittent central suppression. These are students without strabismus or severe amblyopia but have lapses of interrupted binocular vision disrupting their reading abilities. Why does this type of intermittant suppression happen? Traditionally suppression was thought of as a cortical inhibitory process all the way back at the visual cortex. Hussey, however, proposes that suppression is not solely contributable to inhibition at the cortical level. He suggests that suppression is the result of lack of development or disruption of the motion (magnocellular) neural pathway. This lack of development in the early stages of the visual process results in a lack of binocular integration further down the line, notably at the visual and extrastriate areas of the cortex. This principle is further elaborated in Eric Hussey’s paper ‘Is Anti-Suppression the quest for visibility’ which will be published in the journal of Optometry & Visual Performance in the near future. So if, in cases of Intermittant Central Suppression, an underdeveloped primary visual motion pathway rather than inhibition at the level of the visual cortex is the main problem, treatment should be targeted accordingly. Motion should be used stimulating this pathway and consequently encouraging more solid binocular vision. In short when using Rapid Alternate Occlusion while doing a binocular activity these goggles provide a constant motion stimulus, even if put on a frequency at which motion is no longer consciously perceived. Frequent use wakes up this underdeveloped motion pathway, increases binocular viewing time and gradually ‘glues’ the eyes together. To learn about the consequent improvements in reading ability in students undergoing the treatment, which are above those of control groups and not attributable to any other factors, you should take the time to read the ‘Remote treatment of intermittent central suppression improves quality-of-life measures‘ study. Other ways this device may influence binocular vision (according to me)! Vision is as much about retinal information (the visual stream) as it is about extra-retinal information (proprioception and efference copy). If you don’t understand some of those words, that’s alright. As mentioned above, the goggles stimulate the visual motion perception pathway by the constant motion of the rapid on off alternation and thus a constant change in retinal input. That is the grunt work of anti-suppression, as Eric calls it, and should ultimately ‘glue’ the eyes together. Rapid Alternate Occlusion might also influence the interplay of retinal and extra-retinal information. During the brief period of occlusion your brain doesn’t have a visual reference of where your eyes are pointing, forcing your visual system to rely on other mechanisms like proprioception to keep its gaze steady and avoid uncontroled retinal slippage. If during occlusion the visual system relies too much on (absent) retinal information to stabilize gaze, and too little on extra-retinal information, one or both of the eyes will start drifting. Uncontroled retinal slippage is what sometimes happens to me while using the goggles because the proprioception and control of the muscles surrounding my eyes (extra-ocular muscles) has been significantly impaired through strabismus surgery. Therefore, another effect of these goggles then is that they constantly force the visual system to re-evaluate itself and stay busy relying on different neural information to accomplish gaze stability. This too will improve visual stamina! As it forces the visual motion pathway to stay active and develop itself more fully, it also forces these two types of neural input to integrate more fully to deal with the visual challenge imposed by the goggles. I have a visual history of alternating strabismus with pretty good eye sight in both eyes. I have experienced constant double vision for a couple of years. Nowadays my eye alignment has improved to the point that I have aligned eyes most of the time. Traditionally I used to be a esotrope but after surgery my strabismus became non-committant with a tendency towards exotropia. Right now I still have Convergence Insufficiency and intermittant suppression in certain fields of vision resulting in a lack of real binocular fusion. I’m pretty confident as far as further ocular motility improvements go. I can eliminate the Convergence Insufficiency by continuing my visually conscious lifestyle. It’s also important to realize that these are not separate issues. If Convergence Insufficiency disrupts eye alignment for near tasks, there is no fusion. If there is no binocular fusion, eyes have a tendency to wander. With these goggles I hope to continue and accelerate the ‘grunt work’ of anti-suppression. It will do so by means of a combination of the retinal and extra-retinal information mechanisms described above. I use it every day while doing not so spectacular tasks like watching TV, daily domestic activities (if it doesn’t get in the way) or maybe some brief reading. I have yet to use it with a Cheiroscope as demonstrated in the video next time I go for VT. It does feel intense and the increased visual load tires you. Unsurprisingly it also tires people without a history of binocular problems. Go figure. Nevertheless, the theory makes sense and it feels visually intensive in various ways so I’m very curious about what the results of my experiment will be! Hi, I am an Optometrist practing vision therapy and I’m interested in this device. I believe these can help me in my work. Please let me know more about this and how can I get one. Thanks. Contact the OEPF at http://www.oepf.org. Good luck and thanks for your service! How does it feel to live with Ménière’s syndrome?